In a study of over 1,000 people who showed no evidence of heart or artery disease, some took aspirin, others a non-active placebo and a third group used no treatment at all. Around 250 patients needed to be treated with aspirin for five years to prevent a single heart attack, stroke or death caused by cardiovascular disease, said researchers. However, people taking aspirin were 43% more at risk of a major bleeding episode than those not using the drug, meaning roughly one in 200 people treated with aspirin could expect a major bleed. 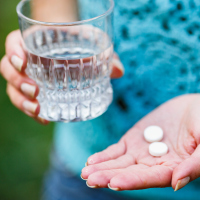 Taking too much aspirin is well known to thin blood and increase the risk of intestinal bleeding. Lead researcher Dr Sean Zheng, from King's College London, said the study demonstrated that there is insufficient evidence to recommend routine aspirin use in the prevention cardiovascular related deaths in people with cardiovascular disease. He said: "There has been more uncertainty surrounding what should be done in patients who are at higher risk of cardiovascular disease and in patients with diabetes. "This study shows that while cardiovascular events may be reduced in these patients, these benefits are matched by an increased risk of major bleeding events." Dr Zheng added: "Aspirin use requires discussion between the patient and their physician, with the knowledge that any small potential cardiovascular benefits are weighed up against the real risk of severe bleeding." Commenting on the findings published in the Journal of the American Medical Association, Professor Stephen Evans, from the London School of Hygiene & Tropical Medicine, said: "The message for healthy patients is that taking aspirin has a small benefit to prevent heart disease but also at least as large a harm in terms of serious bleeding. "For some individual patients the balance may tip more clearly in either direction." If you're living with a heart condition and need great value cover, check out our dedicated heart conditions travel insurance today.